Beijing (AFP) - Straight in at number one on the Chinese government's banned songs chart is IN3, a trio of brash, tattooed rappers who mix the earthy language of Beijing's streets with classic hip hop beats. And number two. And three. And so on, down to number 17. They have played packed houses in Beijing for a decade, but all three were detained after China's culture ministry published the list of 120 songs barred from the Internet for "trumpeting obscenity, violence, crime and harming social morality". The hard knocks came as China's ruling Communist Party tightens regulation of culture under President Xi Jinping, who has called on artists to "serve socialism". IN3 always had a confident swagger but avoided strictly banned topics such as condemning the Communist Party leadership -– preferring to namecheck Nike trainers and Playstations. But now they may never be able to perform in their home city again following the online ban. Their best-known song "Beijing Evening News" -– third on the government's list -- chronicles the capital's night life, touching on drunken driving, chasing women and brawls with bar owners. It also contains broadsides against high medicine costs and school fees, heavy traffic and even poorly soundproofed apartment blocks -- topics generally acceptable to state censors. "Some sleep in subway underpasses, others eat out on government expenses," the group chant, obliquely referencing official corruption. Wearing a black baseball cap labelled "Compton" and brown Converse shoes, band member Jia Wei told AFP: "We don't want just to criticise society, we want society to progress." "I'm not giving up hip hop," he said. The group saved their harshest rhymes for China's strict education system, which Jia has called the country's "biggest problem". It was pilloried in probably their most outspoken track, "Hello Teacher" -- where they threaten to draw sexually explicit doodles in their exercise books, and call on "shameless" instructors to "die quickly". It was number one on the culture ministry's Top 120. Relations with authorities were not always as tense. One band member, Chen Haoran, studied clarinet at China's prestigious Central Conservatory of Music. When the Olympics arrived in China's capital in 2008, local television filmed the group in the city's ancient hutong alleyways, rapping: "Beijing is your home, even foreigners speak like Beijingers, they will cheer team China on." The same year they won praise from the state-run press which dubbed them the "bling dynasty's bad boys". But their flow has been interrupted by ever-tighter limits on expression. Official approval for shows has been harder to come by in recent years, Jia said, while others have been shut down at the last minute. In 2014 Communist leader Xi urged artists not to chase popularity with "vulgar works". "Art and culture will emit the greatest positive energy when the Marxist view is firmly established," he said in a speech which drew comparison with the diktats of Mao Zedong. Their new blacklisted status means IN3 are unlikely to grace Beijing's stages again. "Of course I'm upset. They rap about the kind of stories which happen every day to my friends," said local fan Amy Wang. Searching for an alternative venue, IN3 held a gig in Yunnan province, some 3,000 kilometres (1865 miles) from Beijing, but just minutes after they landed back in the capital police boarded their flight to handcuff and hood them, Jia said. The band -- whose members have previously been open about consuming cannabis -- were all held on drug-related charges, Jia said. Beijing has stepped up a campaign against celebrity users which in January 2015 saw Jackie Chan's son jailed for six months. Jia said he was released after a week when police found no evidence he had dealt the drug, but added he believed their music was a factor in the detention, just weeks after the blacklist was released in August. "I think we were taken in because of our songs," he said. "We were locked into interrogation chairs, and they kept the hood on us. They wanted to scare me." Police did not respond to a request for comment by AFP. Since their release, IN3 -- who cite The Clash and Bob Marley as influences -– travelled to Atlanta in the United States to record at the studios of hip hop legends Outkast. The genre is still marginal in China's music scene, dominated by love songs, imported pop and patriotic tunes dating from the era of Mao Zedong. 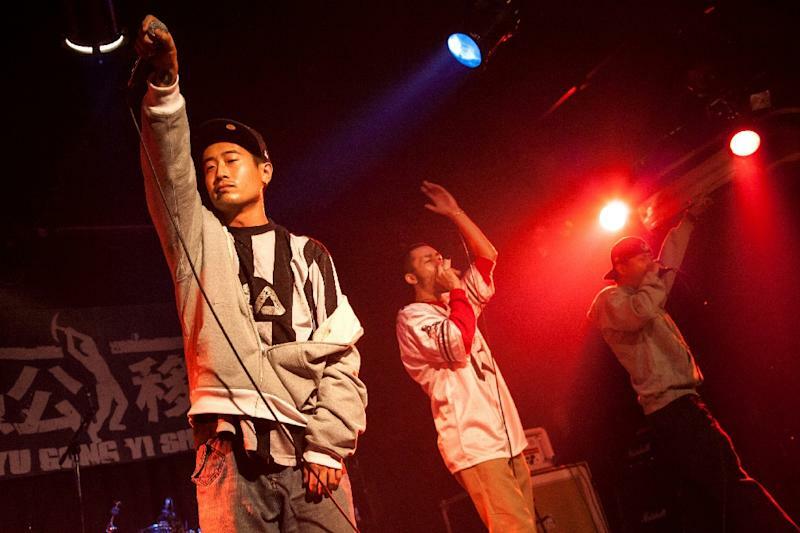 Mainland China's first major rap collective Yin Tsang released their first album in 2003, shunning politics in favour of goofball intonation and uplifting anthems, and their songs still receive regular airings on Chinese radio. There are now dozens of similarly commercial acts, but IN3's lyrics "are reflections of our generation and are real", said DJ Wordy, a mainstay of the Beijing scene. "In hip hop, if you don't talk about the government and real stuff, you can do whatever you want," he said. All of the city's biggest popular music festivals were cancelled without notice throughout the year, he pointed out. "Right now in Beijing it is not a good time for anything in music."